Mast cells have been implicated as the central effectors in allergic responses, yet a fatal anaphylactic response can be induced in mast cell-deficient mice. In this study, we examined the immediate hypersensitivity response in wild-type (WT) and mast cell-deficient mice (W/Wv) in two different tissues (skin and skeletal muscle). Vascular permeability and leukocyte recruitment were studied after immediate challenge or 4 h postchallenge in OVA-sensitized mice. In skin, immediate challenge induced a significant increase in vascular permeability (75%) within 30 min and was accompanied by increased leukocyte adhesion 4 h postchallenge. In the absence of mast cells, no changes in vascular permeability or leukocyte recruitment were observed in skin. In WT skeletal muscle, immediate challenge induced a rapid increase (80%) in vascular permeability within 5 min and significant leukocyte recruitment after 4 h. Surprisingly, in W/Wv, a gradual increase in vascular permeability was observed, reaching a maximum (50%) within 30 min. Despite the absence of mast cells, subsequent leukocyte emigration was similar to that observed in WT mice. Pretreatment with anti-platelet serum in W/Wv returned Ag-induced vascular permeability and leukocyte recruitment to baseline. Platelets were shown to interact with endothelium in skeletal muscle, but not dermal microvasculature. These data illustrate that mast cells play a prominent role in vascular permeability and leukocyte recruitment in skin in response to Ag, however, in skeletal muscle; these changes can occur in the absence of mast cells, and are mediated, in part, by the presence of platelets. Hypersensitivity or allergy is a deleterious inflammatory response to the presence of Ag and is the basis of many diseases, such as asthma, rhinitis, eczema, and food allergies. These reactions are reaching epidemic proportions in both the developed and developing world (1), and the most severe allergic response, anaphylactic shock, can result in death. Immediate hypersensitivity reactions are responses to Ab or Ag-Ab complexes, and the symptoms occur rapidly (within minutes and hours) following antigenic challenge in sensitized individuals. Some of the manifestations of allergic reactions include rapid edema caused by increased vascular permeability, followed by increased leukocyte infiltration to the site of Ag exposure. A key cell that has long been thought to play a major role in the development of type I IgE-mediated hypersensitivity to allergen is the mast cell (2, 3). These cells lie juxtaposed to the microcirculation, and their mediators can elicit enhanced microvascular permeability and up-regulate the adhesion molecules required for the recruitment of leukocytes (4, 5). In addition, the leukocyte infiltration observed 6 h after Ag challenge in normal mice skin is virtually undetectable in genetically mast cell-deficient mice (3). However, several studies suggest that mast cell degranulation is not the only mechanism involved in hypersensitivity reactions (6, 7, 8, 9, 10). For example, several groups have reported that fatal systemic IgG- or IgE-mediated anaphylaxis can be elicited in mast cell-deficient mice (7, 8, 9). It is possible that the small number of mast cells present in W/Wv mice (<1% in skin; none elsewhere) is sufficient to induce fatal anaphylactic shock. However, another more likely possibility is that other cells or cell types are involved in allergic responses. The mast cell-independent mechanisms in immediate hypersensitivity reactions are unknown. However, platelets have been evoked in delayed-type hypersensitivity (T cell-mediated) reactions (6). Although it is not known currently whether platelets are involved in immediate hypersensitivity reactions, platelets have been described as having FcεRII (FcεRII/CD23) on their plasma membranes (11, 12, 13) that can bind IgE with low affinity. In addition, platelets have FcγR (14), which may also participate in allergic immune response (15). Platelets contain granules that contain mediators that can increase vascular permeability such as serotonin (5-hydroxytryptamine (5-HT)),3 as well as chemotactic factors such as platelet-activating factor4 (PAF4) and many other proinflammatory mediators (16). In addition, platelets may play a role in amplifying the inflammatory response by cooperating with other cells, such as the neutrophil, to increase the production of chemotactic factors (17, 18). In vitro, leukocytes have been shown to roll and adhere on activated platelet monolayers, demonstrating the potential for platelets to assist in the recruitment of leukocytes from the circulation (19). In vivo, TNF-α induced significant platelet paving of brain pial endothelium and leukocyte rolling and adhesion, which could be attenuated by pretreatment with anti-platelet Ab (20). However, in response to the same provocation (TNF-α) in the skin, platelet depletion did not attenuate polymorphonuclear infiltration, suggesting the role of platelets in leukocyte recruitment may be tissue dependent (21). The reason for this is not determined to date. In this study, we use intravital microscopy to allow direct visualization of the immediate allergic response in vivo, especially vascular permeability changes and immediate effects on leukocyte recruitment. Studies to date have used retrospective techniques such as edema formation and histological analysis to study these parameters. We evaluated changes in vascular permeability and leukocyte recruitment in skeletal muscle and skin in wild-type (WT) and mast cell-deficient (W/Wv) mice. Skeletal muscle represents a significant portion of the body mass and may be implicated in fatal anaphylactic responses. We compare these results with allergic responses in the skin, where mast cells have been shown to play a prominent role. Our results show that immediate allergen-induced vascular responses (increased permeability) and late phase leukocyte recruitment can occur in the absence of mast cells in skeletal muscle. We show for the first time that it is indeed the platelets that increase both allergen-induced permeability and leukocyte recruitment in mast cell-deficient muscle. Male mast cell-deficient WBB6F1-KitW/KitW-v (W/Wv) mice and their WT congenic normal WBB6F1 (WT) mice were purchased from The Jackson Laboratory (Bar Harbor, ME). All mice weighed between 20 and 30 g and were used between 6 and 10 wk of age. Harlan Sprague Dawley rats (Indianapolis, IN) were used for passive anaphylaxis reactions to check mice for OVA sensitization, as described below. Animal protocols were approved by the University of Calgary Animal Care Committee and met the Canadian Guidelines for Animal Research. A type I hypersensitivity reaction was elicited by systemically (i.p. injection) sensitizing animals with 10 μg of chicken OVA (Sigma-Aldrich, St. Louis, MO) and 10 mg of grade V AlOH3 (Sigma-Aldrich) in a total volume of 0.2 ml of saline. Sham-sensitized mice received an i.p. injection of saline alone. Mice were challenged 2 wk later with either OVA or saline (sham), as described in experimental protocol section below. Serum was obtained from all OVA-sensitized animals at the end of the experiment by intracardiac puncture. Serial dilutions (1:8–1:64) of the serum samples were prepared, and 200 μl of each sample was injected intradermally into the shaved backs of Harlan Sprague Dawley rats. After 72 h, animals were challenged with an intracardiac injection of a solution containing 2.5 mg of Evans blue dye and 5 mg of chicken OVA in a total volume of 1.5 ml (saline). The final reaction was read 60 min later as the highest dilution that produced a distinct blue region (Evans blue dye extravasation) at the center of the injection site (22). The majority of sensitized mice had serum anti-OVA Ab titers of 1:64; 74% of WT, and 91% of W/Wv. The remaining mice had titers of 1:32 and were randomly distributed throughout the groups. Sham-sensitized animals had no anti-OVA Ab. Animals were anesthetized with an i.p. injection of a mixture of 10 mg/kg xylazine (MTC Pharmaceuticals, Cambridge, Ontario, Canada) and 200 mg/kg ketamine hydrochloride (Rogar/STB, Montreal, Quebec, Canada). For all protocols, the left jugular vein was cannulated to administer additional anesthetic or fluorescent dyes, if necessary. Animals were then prepared to view either the dermal (skin flap) or the skeletal muscle (cremaster) microcirculation. A midline dorsal incision was made. The skin was carefully separated from the underlying tissue, remaining attached laterally. Blood supply to the skin flap remained intact. The skin flap was then extended over a viewing pedestal, secured along the edges using 4-0 suture exposing the dermal microvasculature. The exposed skin was continuously superfused with warm bicarbonate-buffered saline (pH 7.4) to avoid tissue dehydration. An incision was made in the scrotal skin to expose the left cremaster muscle, which was then carefully removed from the associated fascia. A lengthwise incision was made on the ventral surface of the cremaster muscle using a cautery. The testicle and the epididymis were separated from the underlying muscle and moved into the abdominal cavity. The muscle was then spread out over an optically clear viewing pedestal and secured along the edges with 4-0 suture. The exposed tissue was superfused with warm bicarbonate-buffered saline (pH 7.4). The dermal and cremasteric microcirculations were observed through an intravital microscope (Optiphot-2; Nikon, Tokyo, Japan) with a ×40 water immersion lens (skin flap; 40/0.55 water immersion; Nikon) or a ×25 objective lens (skeletal muscle; L25/0.35 Leitz Wetzlar, Munich, Germany) and a ×10 eyepiece. The cremasteric microcirculation was transilluminated, and images were recorded using a video camera (Panasonic 5100 HS, Osaka, Japan). Due to thickness of the skin flap, leukocyte-endothelial cell interactions were not visible by transillumination. Therefore, for this protocol, animals were injected with the fluorescent dye, rhodamine 6G (0.3 mg/kg i.v. ; Sigma-Aldrich), immediately before microscopic visualization. Rhodamine 6G at the dose used labels leukocyte and platelets and has been shown to allow detection of the same number of rolling leukocyte as transmitted light and have no effect on leukocyte kinetics (23, 24). This allows for quantification of leukocyte rolling flux and adhesion via epifluorescence microscopy. Rhodamine 6G-associated fluorescence was visualized by epi-illumination at 510–560 nm using a 590-nm emission filter (24, 25). The image of the dermal microcirculatory bed was recorded using a silicon-intensified fluorescent camera (model C-2400-08; Hamamatsu Photonics, Hamamatsu City, Japan). Images of the dermal and skeletal muscle microcirculation were projected onto a monitor and recorded using a videocassette for playback analysis. Experiments were performed in cremaster preparations from sensitized/challenged or control mice to confirm that these two methods of visualizing leukocyte kinetics are comparable. Single unbranched venules (25–40 μm in diameter) were selected for vascular permeability and leukocyte kinetics analysis. Venular diameter (DV) was measured using a video caliper (Microcirculation Research Institute, Texas A&M University, College Station, TX). RBC velocity was measured on-line using an optical Doppler velocimeter (Microcirculation Research Institute) and was only measured for the skeletal muscle preparations, as determination of RBC velocity using fluorescence in the skin flap was not possible. Venular blood flow in the skeletal muscle was calculated from the product of cross-sectional area and mean RBC velocity (Vmean = VRBC/1.6), assuming cylindrical geometry. Venular wall shear rate (γ) was calculated based on the Newtonian definition: γ = 8 (Vmean/DV) (26). The number of rolling, adherent, and emigrated leukocytes was determined off-line during video playback analysis. Rolling flux was calculated as the number of cells passing a specific point in 3 min and expressed as cells/minute. A leukocyte was considered to be adherent if it remained stationary for at least 30 s, and total leukocyte adhesion was quantified as the number of adherent cells within a 100 μm length of venule. Leukocyte emigration was defined as the number of cells in the extravascular space within 200 × 300-μm area. Vascular albumin leakage from the microcirculation to the extravascular space was used as a parameter of vascular permeability using a previously published protocol (27). Briefly, FITC-labeled BSA (25 mg/kg; Sigma-Aldrich) was administered i.v. to animals 15 min before the start of the experimental procedure. Fluorescence intensity (excitation wavelength, 420–490 nm; emission wavelength, 520 nm) was detected using a silicon-intensified fluorescent camera (model C-2400-08; Hamamatsu Photonics), and images were recorded for playback analyses using a videocassette recorder. The fluorescent intensity of FITC-BSA within a defined area (10 × 50 μm) of the venule under study and in the adjacent perivascular interstitium (20 μm from venule) was measured during the control period and at various times after application of the Ag. This was accomplished with a video capture board (Visionplus AT-OFG; Imaging Technology, Bedford, MA) and a computer-assisted digital-imaging processor (Optimas; Bioscan, Edmonds, WA). The index of vascular albumin leakage (permeability index; percentage of ratio external/internal) was determined from the ratio of (interstitial intensity − background) (external) to (venular intensity − background) (internal) as previously reported (28). Skeletal muscle and skin preparations in WT or W/Wv-sensitized or sham-sensitized mice were prepared for intravital microscopy, as previously described. To examine the immediate allergic response, mice were challenged with OVA (50 μg/ml) in the superfusion buffer after a control period was videotaped. Leukocyte kinetics and vascular permeability were measured in skin and cremaster preparations for at least 30 min following challenge. To examine the late phase response (4 h postchallenge), mice were given a local injection of OVA (intrascrotal, 10 μg; or intradermal, 100 μg) 4 h before observation. Sensitized sham-challenged and nonsensitized OVA-challenged mast cell-deficient or WT counterparts were used as controls. Data obtained from these control groups were not statistically different; therefore, for simplicity, only data from sensitized sham-challenged mice are presented. Leukocyte kinetics and vascular permeability were monitored in the skin or cremasteric microcirculation over a 1-h period 3.5–4.5 h postchallenge. In separate experiments, animals were pretreated with rabbit anti-mouse platelet serum (0.5 ml/Kg; Accurate Chemical and Scientific, Westbury, NY) 4 h before immediate OVA challenge or 1 h before OVA challenge to study the late response. In a separate set of experiments, platelet-endothelium interactions were observed in dermal and cremasteric microcirculation. Platelet-rich plasma was obtained by a method previously described (29). Briefly, mouse blood was obtained by cardiac puncture in acid-citrate-dextrose (ACD 1:9 blood v/v) and centrifuged at room temperature for 8 min at 1000 rpm. The plasma was removed and subsequently centrifuged at 1000 rpm for 3 min to obtain platelet-rich plasma, which was filtered through a Sepharose 2B column equilibrated with PIPES buffer (pH 7.0). The activation state of the isolated platelets was checked by examining surface P-selectin expression using FACS analysis, as previously described (29). Thrombin-stimulated samples were used as positive controls. Only nonactivated gel-filtered platelet preparations were used for the in vivo experiments. Gel-filtered platelets were fluorescently labeled with calcein AM (25 μg/ml; Molecular Probes, Eugene, OR) and diluted to 5 × 107 platelets/ml with PBS (pH 7.4), then injected i.v. in 0.2–0.4 ml vol. Platelet-endothelial cell interactions were studied during the immediate hypersensitivity response in sensitized and nonsensitized WT mice. Platelet-Endothelial interactions were recorded before and after challenge with OVA buffer, as previously outlined. Platelets were determined to be interacting with the endothelium if they rolled for at least 30 μm along the vessel or were stationary for 10 s or longer. The number of interactions was quantified for 60 s at each time point in 250 μm of venule. Values have been adjusted and expressed as platelet interactions/100 μm/5 min to allow comparison of data with number of leukocyte interactions. At the end of each experiment, whole blood was drawn via cardiac puncture. Total leukocyte counts were performed using a hemocytometer (Bright-line; Hausser Scientific, Horsham, PA). The number of platelets was counted using an automatic blood cell machine (STK-S; Coulter, Seattle, WA) in mice treated with anti-platelet Ab or their controls. The results were expressed as means ± SEM. Statistical significance was assessed using Student’s t test or ANOVA with a Bonferoni correction where necessary. Statistical significance was taken at p < 0.05. Vascular permeability (Fig. 1⇓) was observed in the dermal microvasculature of sensitized mast cell-deficient or WT mice. Recordings were made under baseline conditions and for 30 min following immediate Ag challenge. The late phase response was observed 4 h post-OVA challenge in a separate group of mice. Baseline vascular permeability in the skin was significantly higher in WT mice compared with W/Wv mice (Fig. 1⇓) most likely due to preparation-induced stimulation of mast cells, as W/Wv sham controls had consistently lower permeability levels than WT sham controls (data not shown). In WT mice, vascular leakage of FITC-albumin increased after Ag challenge, reaching ∼75% by 30 min postchallenge. In contrast, no increase in vascular permeability was observed in W/Wv mice over the 30-min period studied. By 4 h post-Ag challenge, WT FITC-albumin leakage had returned to control levels and was not significantly different from W/Wv levels. The immediate increase in vascular permeability observed in WT mice resulted in an increase in leukocyte rolling flux (Fig. 2⇓A) and adhesion (Fig. 2⇓B) in WT mice 4 h post-OVA challenge. This increase in leukocyte recruitment during the late phase allergic reaction in the skin was entirely mast cell dependent, as no increase in leukocyte rolling or adhesion was observed in sensitized/challenged W/Wv mice (Fig. 2⇓). Mast cells are responsible for vascular permeability changes in skin during immediate hypersensitivity. Vascular permeability measured by FITC-albumin leakage (% ratio of external/internal fluorescence) in dermal venules of sensitized WT (▴) or mast cell-deficient (▵) mice. Recordings were made under baseline conditions (0 time point) and over 30 min following immediate OVA challenge in superfusion buffer (50 μg/ml). In a separate group of animals, the late phase response was recorded 4 h post-s.c. Ag (100 μg) challenge. Values represent the mean ± SEM (3 ≤ n ≤ 4). ∗, Significant increase from W/Wv group. Late phase leukocyte recruitment in skin is mast cell dependent. Leukocyte rolling flux (cells/min) (A) and leukocyte adhesion (cells/100 μm/min) (B) in dermal venules of sensitized WT (▪) or W/Wv mice (▧). Control data from sham-sensitized mice are shown in □. Values were taken 4 h after s.c. challenge with 100 μg of OVA. Values represent the mean ± SEM (n = 4). ∗, Significant increase over sham or W/Wv group. These data suggest that mast cells are responsible for the rapid increase in vascular permeability observed during the immediate hypersensitivity reaction in skin and the subsequent leukocyte recruitment during the late phase reaction. Table I⇓ outlines the hemodynamic parameters in cremaster microvasculature in sensitized WT and W/Wv mice 1 and 4 h postchallenge. White blood cell counts were similar in all groups studied. RBC velocity and vascular wall shear rates did not differ significantly between sham-challenged and OVA challenge WT mice or in W/Wv mice at either time point. 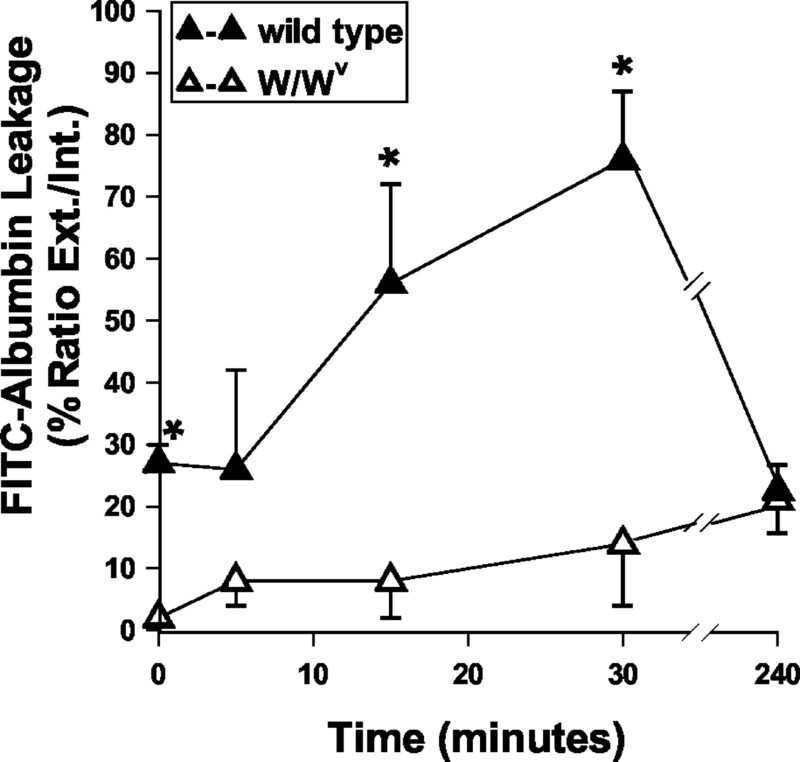 Challenge with Ag in sensitized WT mice induced a rapid increase in vascular permeability in the cremaster preparation, with a maximal response (80%) reached within 5 min (Fig. 3⇓). Surprisingly, when sensitized W/Wv mice were challenged with Ag, an increase in vascular permeability was also observed. This increase in vascular permeability was less immediate in onset than that observed in sensitized/challenged WT mice, reaching ∼50% after 15 min. Baseline vascular permeability levels in sham-challenged WT mice are shown by • (Fig. 3⇓). FITC-albumin leakage in sham-challenged W/Wv mice remained below 10% for the duration of the experiment (data not shown). 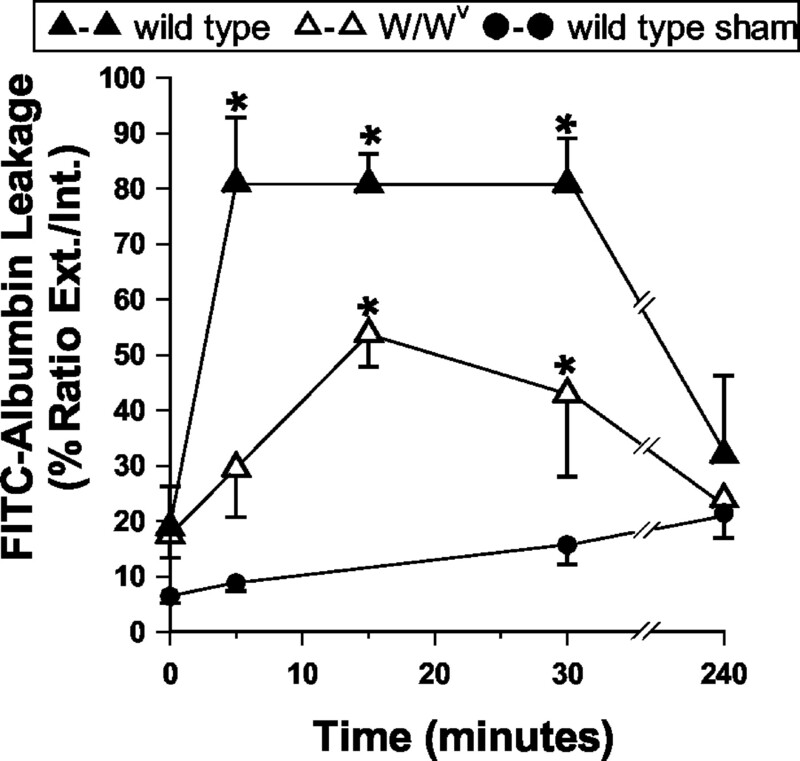 By 4 h postchallenge, FITC-albumin leakage in skeletal muscle had returned to control levels for both sensitized WT and W/Wv mice (Fig. 3⇓). These data demonstrate that an increase in vascular permeability can occur in the absence of mast cells in muscle, suggesting a significant contribution to the immediate hypersensitivity response from another source. Vascular permeability changes occur in skeletal muscle during immediate hypersensitivity despite the absence of mast cells. Vascular permeability expressed as FITC-albumin leakage (% ratio of external/internal fluorescence) in cremasteric venules of sensitized WT (▴) and mast cell-deficient (▵) mice. Vascular permeability data in sham-challenged-sensitized WT mice are indicated by • (15-min data point not available). Recordings were made under baseline conditions (0 time point) and over 30 min following immediate OVA challenge in superfusion buffer (50 μg/ml). In a separate group of animals, the late phase response was recorded 4 h postintrascrotal Ag (10 μg) challenge. Values represent the mean ± SEM (4 ≤ n ≤ 6). ∗, Significant increase over sham data from WT or mast cell-deficient mice. Ag challenge in sensitized WT mice induced a significant increase in leukocyte rolling flux (Fig. 4⇓A), which was accompanied by a significant increase in leukocyte adhesion and emigration 4 h post-OVA challenge (Fig. 4⇓, B and C) in skeletal muscle. Late phase leukocyte recruitment in skeletal muscle is mast cell independent. Leukocyte rolling flux (cells/min) (A), leukocyte adhesion (cells/100 μm/5 min) (B), and leukocyte emigration (cells/field) (C) in cremasteric venules of sensitized WT (▪) or W/Wv mice (▨). Control data from sham-sensitized mice are shown in □. Values were taken 4 h after challenge with 10 μg of intrascrotal OVA. Values represent the mean ± SEM (n = 6). ∗, Significant increase over sham group. No significant difference in leukocyte velocity was observed between the sham- and OVA-treated mice (data not shown). Leukocyte recruitment in WT mice could be detected as early as 60 min postimmediate challenge (data not shown). No early leukocyte recruitment was evident in sensitized W/Wv mice (data not shown); however, by 4 h post-OVA challenge, an increase in leukocyte rolling flux, adhesion, and emigration equivalent to that observed in WT mice was observed (Fig. 4⇑). In direct contrast to what we observed in the skin, these data illustrate that in the absence of mast cells, leukocyte recruitment in response to allergen was delayed in sensitized muscle, but not prevented. Leukocyte kinetics (rolling velocity, rolling flux, and adhesion) in cremaster preparations from sensitized/challenged or control mice was comparable when measured using transilluminations or fluourescence microscopy (data not shown), demonstrating that the tissue differences are not due to the different methodologies used to visualize circulating leukocytes. These data suggest that mediators from another source are participating in this immediate allergic response in skeletal muscle. To study the role of platelets in vascular permeability and leukocyte recruitment during OVA-induced hypersensitivity, anti-platelet Ab was given to sensitized W/Wv mice before Ag challenge. Hemodynamic parameters (venular diameter, RBC velocity, and shear rate) were similar in W/Wv mice with and without anti-platelet Ab (Table II⇓). Treatment with anti-platelet Ab reduced the total number of platelets in sensitized/challenged W/Wv mice by >99% (Fig. 5⇓, inset), but did not alter the total number of circulating leukocytes (Table II⇓). 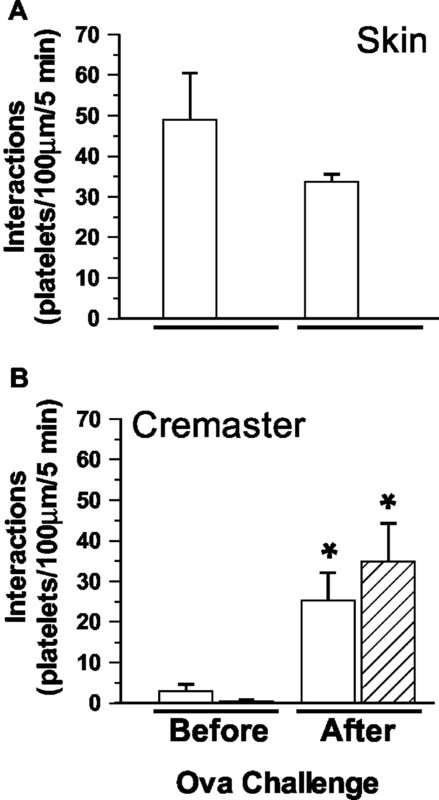 Platelets play a role in vascular permeability increases in skeletal muscle during the immediate hypersensitivity reaction in the absence of mast cells. Vascular permeability expressed as FITC-albumin leakage (% ratio of external/internal fluorescence) in cremasteric venules of sensitized W/Wv mice either untreated (▴) or pretreated with anti-platelet Ab (▵). Control data from sham-challenged-sensitized W/Wv groups are indicated by • (15-min data point not available). Values were taken before (0 time point) and for 60 min after OVA challenge (50 μg/ml) in superfusion buffer. In a separate group of animals, the late phase response was recorded 4 h postintrascrotal OVA (10 μg) challenge. Values represent the mean ± SEM (3 ≤ n ≤ 5). ∗, Significant increase over sham data. #, Significant decrease from W/Wv mice without Ab. Inset, Illustrates platelet depletion is >99% within 1 h of treatment with anti-platelet Ab and is maintained for the duration of the experiment. 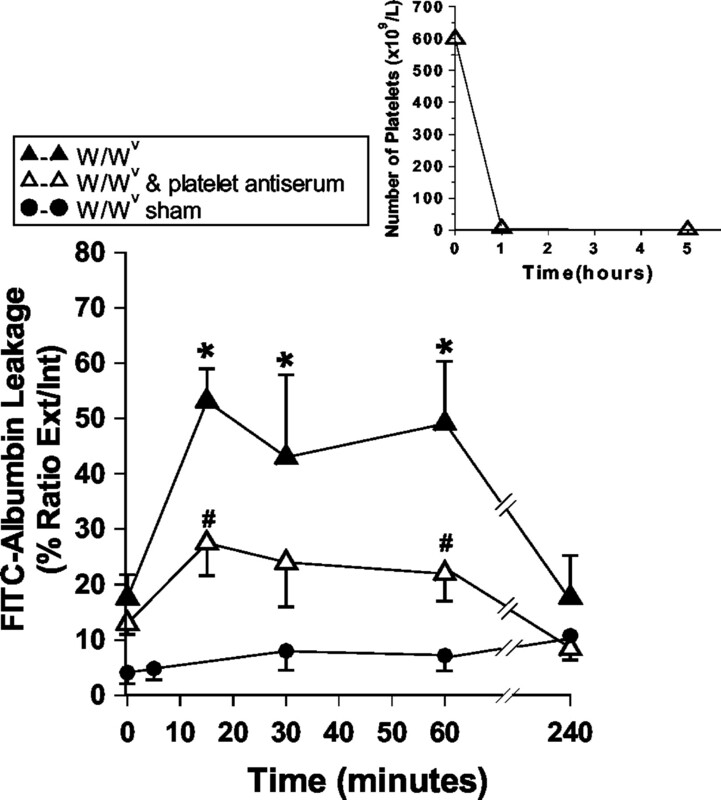 Anti-platelet Ab treatment reduced platelet numbers in W/Wv or WT mice by >98% within 1 h of administration, and this depletion was maintained for the duration of the experiments (Fig. 5⇑, inset). In W/Wv mice, vascular permeability changes observed during the immediate hypersensitivity response were significantly attenuated after anti-platelet Ab treatment (Fig. 5⇑). By 4 h postchallenge, vascular permeability in sensitized/challenged W/Wv mice treated with and without anti-platelet Ab was back to control levels. In sensitized WT mice, treatment with anti-platelet serum did not affect the rapid increase in vascular permeability observed after immediate challenge with Ag in skeletal muscle (data not shown). These data illustrate that in the absence of mast cells, platelets have a role in OVA-induced vascular permeability. Fig. 6⇓ illustrates leukocyte rolling, adherence, and emigration in sensitized W/Wv mice 4 h postchallenge. As previously noted, W/Wv mice were able to recruit leukocytes during the late phase response, as indicated by a significant increase in rolling (Fig. 6⇓A), adhesion (Fig. 6⇓B), and emigration (Fig. 6⇓C) over sham-treated controls. When W/Wv mice were pretreated with anti-platelet Ab, a significant reduction in leukocyte rolling, but not adhesion, was noted. Platelet depletion, however, did significantly attenuate the number of leukocytes that eventually emigrated to the tissue, demonstrating a role for platelets in late phase leukocyte recruitment. This role for platelets was only unmasked in the absence of mast cells, as no inhibition in leukocyte recruitment was observed in WT mice depleted of platelets (data not shown). Platelet depletion inhibits late phase leukocyte recruitment in the absence of mast cells. Leukocyte rolling flux (cells/min) (A), leukocyte adhesion (cells/100 μm/min) (B), and leukocyte emigration (cells/field) (C) in cremasteric venules of sensitized W/Wv mice with (▨) or without (▪) anti-platelet Ab treatment. Control data from sham-sensitized mice are shown in □. Values were taken 4 h after challenge with 10 μg of intrascrotal OVA. Values represent the mean ± SEM (4 ≤ n ≤ 5). ∗, Significant increase from sham-sensitized group; #, significant decrease from W/Wv group without Ab. Fig. 7⇓ depicts platelet endothelium interactions (rolling and adherence) in sensitized WT mice in both dermal and skeletal muscle preparations before and 30 min after challenge with Ag. In skeletal muscle, an average of three platelet interactions was noted under baseline conditions; however, after 30-min OVA challenge, a significant increase in the number of platelet interactions was observed (25.0 ± 6.9 platelets/100 μm/5 min). An increase in platelet interactions was not observed in the cremaster of nonsensitized mice challenged with OVA (data not shown). In contrast, platelet interactions in the dermal microvasculature did not increase significantly after OVA challenge despite being more prevalent under baseline conditions. Sensitized platelet interactions increase in skeletal muscle, but not dermal endothelium of sensitized mice after Ag challenge. Total number of platelet interactions (platelets/100 μm/5 min) in the dermal microvasculature (A) or skeletal muscle microvasculature (B) in sensitized WT mice. Platelets were isolated from sensitized WT mice (□), or P-selectin-deficient mice (▨), labeled with calcein AM, and visualized using fluorescence microscopy. Data was obtained under baseline conditions (before challenge) and 30 min following immediate challenge with OVA in the superfusion buffer. Values represent the mean ± SEM (n = 3). ∗, Significant increase from before-challenge data. 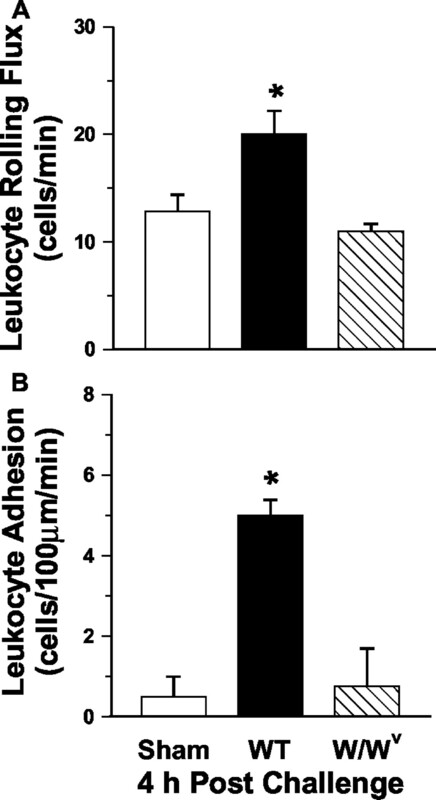 Platelet interactions (rolling and adhesion) in the cremaster post-OVA challenge appeared to be with the endothelium and not by binding to leukocytes because: 1) low levels of leukocyte adhesion were observed in the microvasculature (6.2 ± 2.5 cells/100 μm/5 min) at this time point, and 2) interactions were observed in areas with no apparent leukocyte adhesion. In addition, an increase in platelet interactions was observed after Ag challenge when platelets isolated from P-selectin-deficient mice were used (Fig. 7⇑, ▨). These data demonstrate that platelet P-selectin/leukocyte P-selectin/glycoprotein ligand-1 interactions are not responsible for the platelet interactions observed and support our observations that platelets were interacting with the endothelium. In this study, we have examined the role of mast cells in vascular permeability and leukocyte recruitment during the immediate and late hypersensitivity response using intravital microscopy. To date, vascular permeability and leukocyte recruitment have been studied using retrospective histological techniques and gross measures of edema, respectively. Using intravital microscopy, we can study directly, on-line, the time course of alterations in vascular leakiness and the behavior of leukocytes during the individual phases of the allergic reaction. In this study, we have demonstrated that Ag challenge in sensitized mice induces an increase in vascular permeability in skin that is entirely mast cell dependent, and is associated with a subsequent recruitment of leukocytes during the late phase response. However, in sensitized skeletal muscle, allergen-induced vascular permeability changes are only partially abrogated in mast cell-deficient mice and, surprisingly, the extent of leukocyte recruitment by 4 h postchallenge is commensurate to that observed in congenic mice. These data corroborate previous studies that have shown that anaphylactic reactions can occur in mice genetically deficient in mast cells (8, 30, 31) and suggest that additional sources are involved in promoting the allergic response in tissues other than the skin. During classic allergic reactions, it is known that Ag-specific IgE binds to high affinity FcεR1 receptors expressed on mast cells and basophils. When the allergen is subsequently encountered, it cross-links IgE and stimulates the mast cell to release histamine, serotonin, and a spectrum of preformed cytokines, as well as newly synthesized mediators such as platelet-activating factor, leukotrienes, and many others (4, 32, 33). Many of these chemicals have been shown to have profound effects on adhesion molecule expression and leukocyte recruitment in vivo (34, 35, 36). An alternate source for many of these, or similar mediators is the platelet. Platelets are anucleate cellular fragments containing α granules and dense granules that, upon stimulation, can release a variety of mediators capable of inducing vascular permeability and leukocyte recruitment (37). In this study, we demonstrated that the allergen-induced, mast cell-independent increase in vascular permeability could be abrograted by the depletion of circulating platelets (>99%), confirming that this cell fragment is an important pool for a mediator of vascular permeability. A likely candidate would be 5-HT because platelets are an important source for 5-HT in mast cell-deficient mice and their WT counterparts (6). In our study, however, depleting circulating platelets also prevented the late phase leukocyte recruitment, illustrating that chemotactic factors are also released from platelets. One such factor could be PAF, which has previously been shown to be involved in OVA-induced leukocyte adhesion in rat mestenteric venules (38). PAF has also been shown to be present in high levels in an IgE-dependent model of systemic anaphylaxis in both congenic and W/Wv mice (30). This study demonstrated that PAF released from a source other than mast cells was critical to the development of anaphylactic shock. Our study would suggest that that source for PAF or other chemotactic agents could be the circulating platelet. Our study demonstrates that the role of mast cells in allergic inflammation is tissue specific. We and others (3) have shown that vascular permeability and leukocyte recruitment in the skin are entirely mast cell dependent. In addition, leukocyte recruitment into rat intestinal tissue is completely prevented in the absence of mast cells during OVA-induced late phase response (39). Yet, in this study in muscle, vascular permeability and leukocyte recruitment are only partially abrogated or unaffected, respectively, in the absence of mast cells. Similarly, leukocyte recruitment into lung is mast cell independent in this model of allergy (40, 41, 42). Previously, this model of immediate hypersensitivity in mice has been shown to be IgE mediated because the ability of serum from OVA-sensitized mice to induce a positive passive cutaneous anaphylaxis reaction was inactivated by heat (43). Although there is no evidence for FcεRI on mouse platelets, platelet degranulation could occur by the binding of IgE through low affinity FcεRII (CD23) or FcεRIII (CD32) receptors (9, 15, 44, 45). In this study, treatment with anti-platelet serum in W/Wv mice returned vascular permeability to baseline levels, suggesting that mast cells and platelets play the major role in OVA-induced vascular permeability in mice. However, our results suggest that a minor role for other cell types in leukocyte recruitment cannot be discounted. Other potential cell types that can release potent biologically activated mediators through IgE-dependent mechanisms are the basophil via FcεRI, or the eosinophil, macrophages, and lymphocytes via FcεRII (CD23) (46). It should be noted, however, that sensitization of mice also results in the production of Ag-specific IgG Abs (15), which can induce passive systemic anaphylactic responses (47); because mouse platelets have FcγR (14), we cannot discount a role for IgG in this allergic response. Platelets may also play a more dominant role depending on the vascular bed being studied. It is clear from this study that sensitized platelets will roll and adhere to sensitized/challenged endothelium in the skeletal muscle, but not in the skin. These platelet interactions are not mediated through platelet P-selectin leukocyte adhesion because an increase in platelet interactions was also observed with P-selectin-deficient platelets. Although there appear to be more platelet-endothelium interactions under baseline conditions in the skin, there is no increase after challenge in sensitized mice. In contrast, the sensitized platelet population will interact in the cremaster only after Ag challenge. These data may suggest a difference in expression of endothelial adhesion molecules between the two tissues and are worthy of further investigation. Recently, Pitchford et al. (48) demonstrated a requirement for platelets in leukocyte recruitment to the lung in OVA-sensitized/challenged mice in the presence of mast cells. In our study, however, the role of platelets is only unmasked in the absence of mast cells because anti-platelet serum had no effect on immediate vascular permeability increases and subsequent leukocyte recruitment in WT mice (data not shown). These data illustrate a redundancy for the platelet response in skeletal muscle under normal conditions, which is only revealed when mast cells are depleted. This redundancy may become apparent and significant in situations in which therapeutic intervention is required to control allergic reactions. In addition, humans platelets do express FcεRI receptors (49) and platelets may have a more dominant and/or synergistic role in hypersensitivity reactions clinically. In conclusion, our data indicate that the platelet can play a compensatory role in the development of immediate allergic responses in skeletal muscle in the absence of mast cells. These data may go part way in explaining the phenomenon of anaphylactic shock observed in mast cell-deficient mice. In addition, it is clear that the level of platelet participation is dependent on the vascular bed studied. These data also emphasize the necessity to target more than simply the mast cell when designing therapeutic strategies to combat immediate allergic reactions. ↵1 This work was supported by a Canadian Institutes of Health Research (CIHR) operating grant and a CIHR group grant. D.-M.M. is a Canadian Institutes of Health Scholar, and D.C.C. is a fellow of the Conselho Nacional de Desenvolvimento Cientifico, Brazil. ↵3 Abbreviations used in this paper: 5-HT, 5-hydroxytryptamine; PAF, platelet-activating factor; WT, wild type. Holgate, S. T.. 1999. The epidemic of allergy and asthma. Nature 402:B2. Galli, S. J., A. M. Dvorak. 1984. What do mast cells have to do with delayed hypersensitivity?. Lab. Invest. 50:365. Wershil, B. K., Z. S. Wang, J. R. Gordon, S. J. Galli. 1991. Recruitment of neutrophils during IgE-dependent cutaneous late phase reactions in the mouse is mast cell-dependent: partial inhibition of the reaction with antiserum against tumor necrosis factor-α. J. Clin. Invest. 87:446. Galli, S. J.. 1993. New concepts about the mast cell. N. Engl. J. Med. 328:257. Metcalfe, D. D., D. Baram, Y. A. Mekori. 1997. Mast cells. Physiol. Rev. 77:1033. Geba, G. P., W. Ptak, G. M. Anderson, V. Paliwal, R. E. Ratzlaff, J. Levin, P. W. Askenase. 1996. Delayed-type hypersensitivity in mast cell-deficient mice: dependence on platelets for expression of contact sensitivity. J. Immunol. 157:557. Ha, T. Y., N. D. Reed, P. K. Crowle. 1986. Immune response potential of mast cell-deficient W/Wv mice. Int. Arch. Allergy Appl. Immunol. 80:85. Jacoby, W., P. V. Cammarata, S. Findlay, S. H. Pincus. 1984. Anaphylaxis in mast cell-deficient mice. J. Invest. Dermatol. 83:302. Martin, T. R., A. Ando, T. Takeishi, I. M. Katona, J. M. Drazen, S. J. Galli. 1993. Mast cells contribute to the changes in heart rate, but not hypotension or death, associated with active anaphylaxis in mice. J. Immunol. 151:367. Martin, T. R., T. Takeishi, H. R. Katz, K. F. Austen, J. M. Drazen, S. J. Galli. 1993. Mast cell activation enhances airway responsiveness to methacholine in the mouse. J. Clin. Invest. 91:1176. Cines, D. B., H. van der Keyl, A. I. Levinson. 1986. In vitro binding of an IgE protein to human platelets. J. Immunol. 136:3433. Joseph, M., C. Auriault, A. Capron, H. Vorng, P. Viens. 1983. A new function for platelets: IgE-dependent killing of schistosomes. Nature 303:810. Joseph, M., A. Capron, J. C. Ameisen, M. Capron, H. Vorng, V. Pancre, J. P. Kusnierz, C. Auriault. 1986. The receptor for IgE on blood platelets. Eur. J. Immunol. 16:306. Looney, R. J.. 1993. Structure and function of human and mouse FcγRII. Blood Cells 19:353. Miyajima, I., D. Dombrowicz, T. R. Martin, J. V. Ravetch, J. P. Kinet, S. J. Galli. 1997. Systemic anaphylaxis in the mouse can be mediated largely through IgG1 and FcγRIII: assessment of the cardiopulmonary changes, mast cell degranulation, and death associated with active or IgE- or IgG1-dependent passive anaphylaxis. J. Clin. Invest. 99:901. Packham, M. A.. 1994. Role of platelets in thrombosis and hemostasis. Can. J. Physiol. Pharmacol. 72:278. Maclouf, J. A., R. C. Murphy. 1988. Transcellular metabolism of neutrophil-derived leukotriene A4 by human platelets: a potential cellular source of leukotriene C4. J. Biol. Chem. 263:174. Raud, J., S. E. Dahlen, G. Smedegard, P. Hedqvist. 1989. An intravital microscopic model for mast cell-dependent inflammation in the hamster cheek pouch. Acta Physiol. Scand. 135:95. Buttrum, S. M., R. Hatton, G. B. Nash. 1993. Selectin-mediated rolling of neutrophils on immobilized platelets. Blood 82:1165. Carvalho-Tavares, J., M. J. Hickey, J. Hutchison, J. Michaud, I. T. Sutcliffe, P. Kubes. 2000. A role for platelets and endothelial selectins in tumor necrosis factor-α-induced leukocyte recruitment in the brain microvasculature. Circ. Res. 87:1141. Senaldi, G., P. F. Piguet. 1997. Platelets play a role in the pathogenesis of the irritant reaction in mice. J. Invest. Dermatol. 108:248. Saloga, J., H. Renz, G. Lack, K. L. Bradley, J. L. Greenstein, G. Larsen, E. W. Gelfand. 1993. Development and transfer of immediate cutaneous hypersensitivity in mice exposed to aerosolized antigen. J. Clin. Invest. 91:133. Nolte, D., P. Schmid, U. Jager, A. Botzlar, F. Roesken, R. Hecht, E. Uhl, K. Messmer, D. Vestweber. 1994. Leukocyte rolling in venules of striated muscle and skin is mediated by P-selectin, not by L-selectin. Am. J. Physiol. 267:H1637. Baatz, H., M. Steinbauer, A. G. Harris, F. Krombach. 1995. Kinetics of white blood cell staining by intravascular administration of rhodamine 6G. Int. J. Microcirc. Clin. Exp. 15:85. Hickey, M. J., K. A. Sharkey, E. G. Sihota, P. H. Reinhardt, J. D. Macmicking, C. Nathan, P. Kubes. 1997. Inducible nitric oxide synthase-deficient mice have enhanced leukocyte-endothelium interactions in endotoxemia. FASEB J. 11:955. House, S. D., H. H. Lipowsky. 1987. Leukocyte-Endothelium adhesion: microhemodynamics in mesentery of the cat. Microvasc. Res. 34:363. Kubes, P., J. P. Gaboury. 1996. Rapid mast cell activation causes leukocyte-dependent and -independent permeability alterations. Am. J. Physiol. 271:H2438. Gaboury, J. P., X. F. Niu, P. Kubes. 1996. Nitric oxide inhibits numerous features of mast cell-induced inflammation. Circulation 93:318. Frenette, P. S., R. C. Johnson, R. O. Hynes, D. D. Wagner. 1995. Platelets roll on stimulated endothelium in vivo: an interaction mediated by endothelial P-selectin. Proc. Natl. Acad. Sci. USA 92:7450. Choi, I. H., Y. M. Shin, J. S. Park, M. S. Lee, E. H. Han, O. H. Chai, S. Y. Im, T. Y. Ha, H. K. Lee. 1998. Immunoglobulin E-dependent active fatal anaphylaxis in mast cell-deficient mice. J. Exp. Med. 188:1587. Ha, T. Y., N. D. Reed. 1987. Systemic anaphylaxis in mast-cell-deficient mice of W/Wv and Sl/Sld genotypes. Exp. Cell Biol. 55:63. Crowe, S. E., M. H. Perdue. 1992. Gastrointestinal food hypersensitivity: basic mechanisms of pathophysiology. Gastroenterology 103:1075. Metcalfe, D. D., J. J. Costa, P. R. Burd. 1992. Mast cells and basophils. J. I. Gallin, and I. M. Goldstein, and R. Snyderman, eds. Inflammation Basic Principles and Clinical Correlates 709.-725. Raven Press, New York. Kubes, P., S. Kanwar. 1994. Histamine induces leukocyte rolling in post-capillary venules: a P-selectin-mediated event. J. Immunol. 152:3570. Sun, X. M., X. W. Qu, W. Huang, D. N. Granger, M. Bree, W. Hsueh. 1996. Role of leukocyte β2-integrin in PAF-induced shock and intestinal injury. Am. J. Physiol. 270:G184. Kubes, P., M. Suzuki, D. N. Granger. 1990. Modulation of PAF-induced leukocyte adherence and increased microvascular permeability. Am. J. Physiol. 259:G859. Klinger, M. H.. 1997. Platelets and inflammation. Anat. Embryol. 196:1. Withers, G. D., P. Kubes, G. Ibbotson, R. B. Scott. 1998. Anaphylaxis-induced mesenteric vascular permeability, granulocyte adhesion, and platelet aggregates in rat. Am. J. Physiol. 275:H274. Yang, P. C., M. C. Berin, L. Yu, M. H. Perdue. 2001. Mucosal pathophysiology and inflammatory changes in the late phase of the intestinal allergic reaction in the rat. Am. J. Pathol. 158:681. Kobayashi, T., T. Miura, T. Haba, M. Sato, I. Serizawa, H. Nagai, K. Ishizaka. 2000. An essential role of mast cells in the development of airway hyperresponsiveness in a murine asthma model. J. Immunol. 164:3855. Williams, C. M., S. J. Galli. 2000. Mast cells can amplify airway reactivity and features of chronic inflammation in an asthma model in mice. J. Exp. Med. 192:455. Takeda, K., E. Hamelmann, A. Joetham, L. D. Shultz, G. L. Larsen, C. G. Irvin, E. W. Gelfand. 1997. Development of eosinophil airway inflammation and airway hyperresponsiveness in mast cell-deficient mice. J. Exp. Med. 186:449. Kanwar, S., D. C. Bullard, M. J. Hickey, C. W. Smith, A. L. Beaudet, B. A. Wolitzky, P. Kubes. 1997. The association between α4-integrin, P-selectin, and E-selectin in an allergic model of inflammation. J. Exp. Med. 185:1077. Konig, W., P. Pfeil, U. Hofmann, J. Bujanowski-Weber, I. Knoller. 1988. Cellular requirements of IgE-antibody regulation. Allergol. Immunopathol. 16:203. Dombrowicz, D., V. Flamand, I. Miyajima, J. V. Ravetch, S. J. Galli, J. P. Kinet. 1997. Absence of FcεRIα chain results in up-regulation of FcγRIII-dependent mast cell degranulation and anaphylaxis: evidence of competition between FcεRI and FcγRIII for limiting amounts of FcR β and γ chains. J. Clin. Invest. 99:915. Conrad, D. H.. 1990. FcεRII/CD23: the low affinity receptor for IgE. Annu. Rev. Immunol. 8:623. Strait, R. T., S. C. Morris, M. Yang, X. W. Qu, F. D. Finkelman. 2002. Pathways of anaphylaxis in the mouse. J. Allergy Clin. Immunol. 109:658. Pitchford, S. C., H. Yano, R. Lever, Y. Riffo-Vasquez, S. Ciferri, M. J. Rose, S. Giannini, S. Momi, D. Spina, B. O’Connor, et al 2003. Platelets are essential for leukocyte recruitment in allergic inflammation. J. Allergy Clin. Immunol. 112:109. Joseph, M., A. S. Gounni, J. P. Kusnierz, H. Vorng, M. Sarfati, J. P. Kinet, A. B. Tonnel, A. Capron, M. Capron. 1997. Expression and functions of the high affinity IgE receptor on human platelets and megakaryocytes precursors. Eur. J. Immunol. 27:2212.